Overview: Multi-facility project with conference rooms, VTC suite, reception, and more. The facility provides participants the ability to quickly congregate and collaborate internally and externally. Design / Build by Bridges SI. 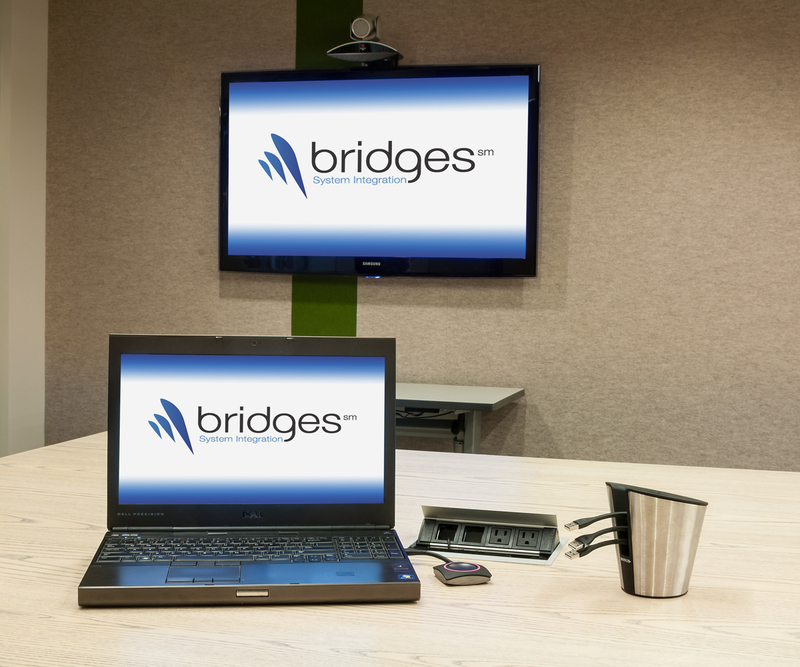 Bridges SI was tasked by Aol. 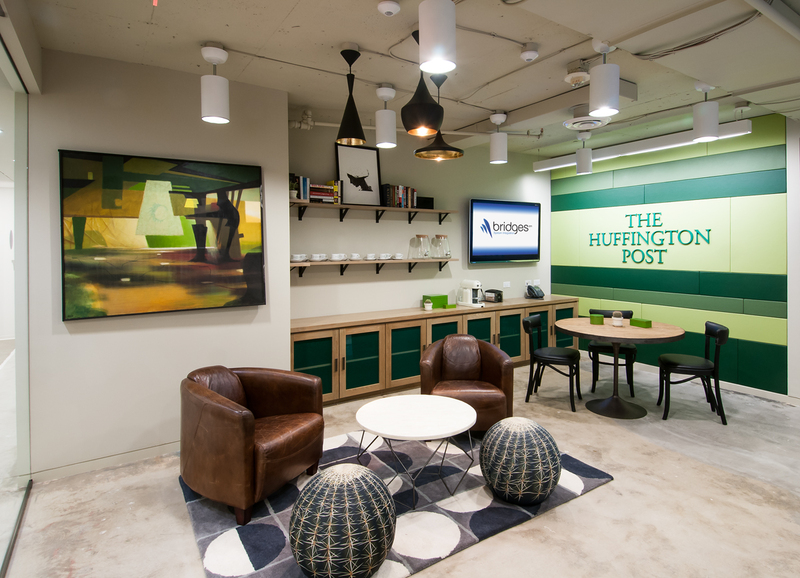 / Huffington Post (AOL) to design an integrated office audiovisual (AV) systems in a downtown corporate office building. The project included a reception area, lounge, conference room, and VTC suite. Walking into the reception area, employees and visitors are immediately greeted with a corporate-branded room equipped with two large displays – one for digital signage and another for general viewing. Overhead speakers provide gentle background music for an experience that is welcoming and easy on the senses. The lounge, also branded with corporate impressions, has a display that provides supplemental viewing while taking a break and relaxing at the water cooler. 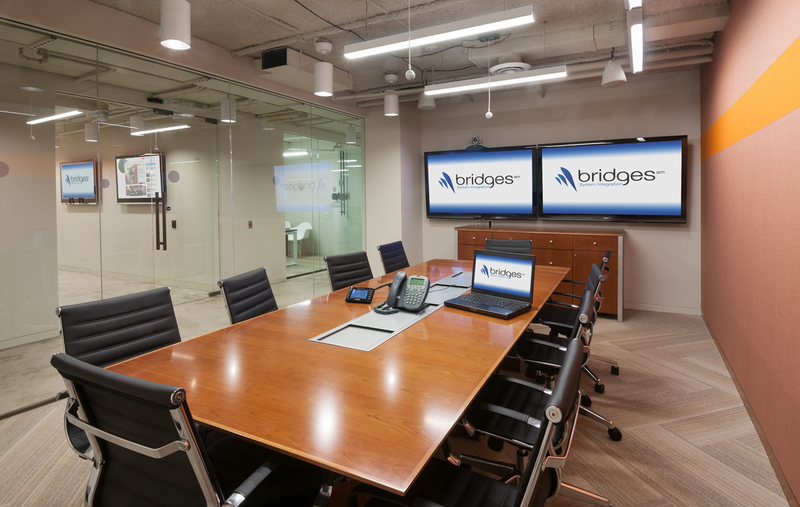 Bridges SI’s engineering and integration efforts coincided with AOL interior design and technical personnel to ensure the AV technologies were deployed in a manner that was consistent with the existing aesthetics of the facility. 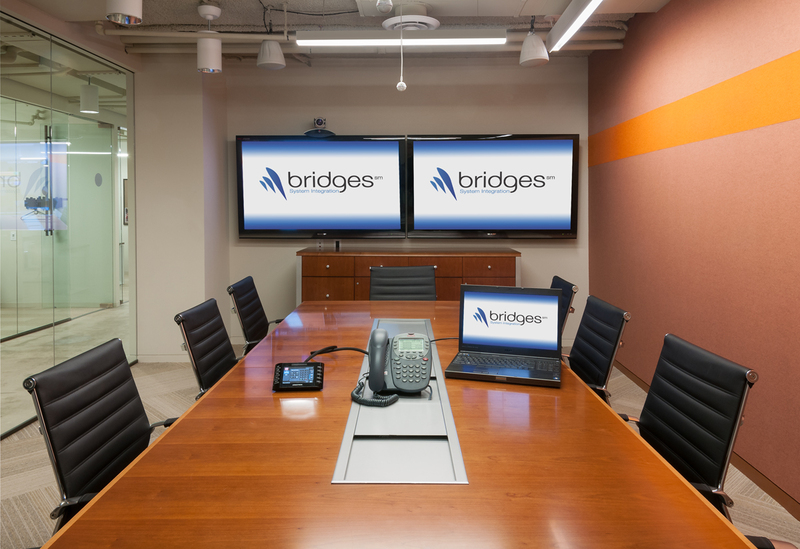 Bridges SI worked with the end-users to maintain industry standards and best practices, all the while ensuring the functional needs of each individual space were realized. 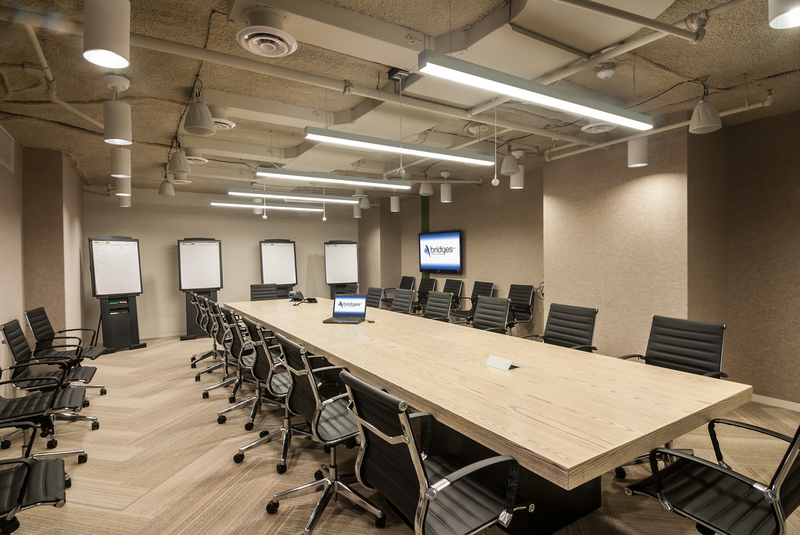 The VTC suite and conference room are the primary functional spaces that were part of the AV installation. The VTC suite was outfitted with a dual display system and tabletop connectivity trough. 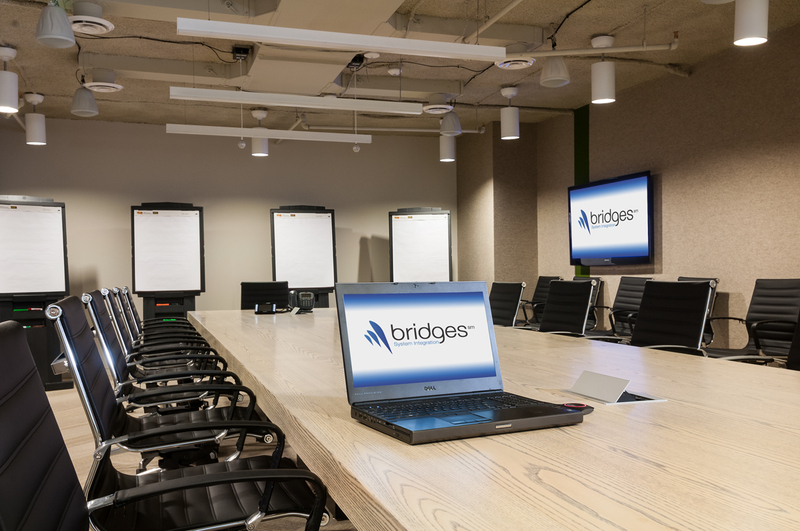 Bridges SI modified the existing executive conference table to accommodate for the tabletop AV, power, and network interfaces. Users can easily connect and disconnect laptops for visualization and content sharing. 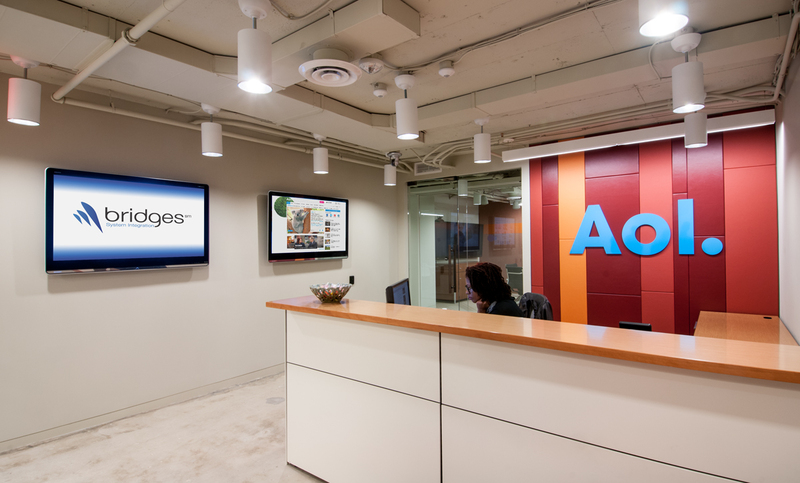 The conference room was designed to facilitate simultaneous collaboration and interaction among teams of AOL creatives, writers, editors, and content specialists. The space was equipped with with multiple connectivity points and a HD display to augment the existing whiteboards the creatives were using prior to the project. 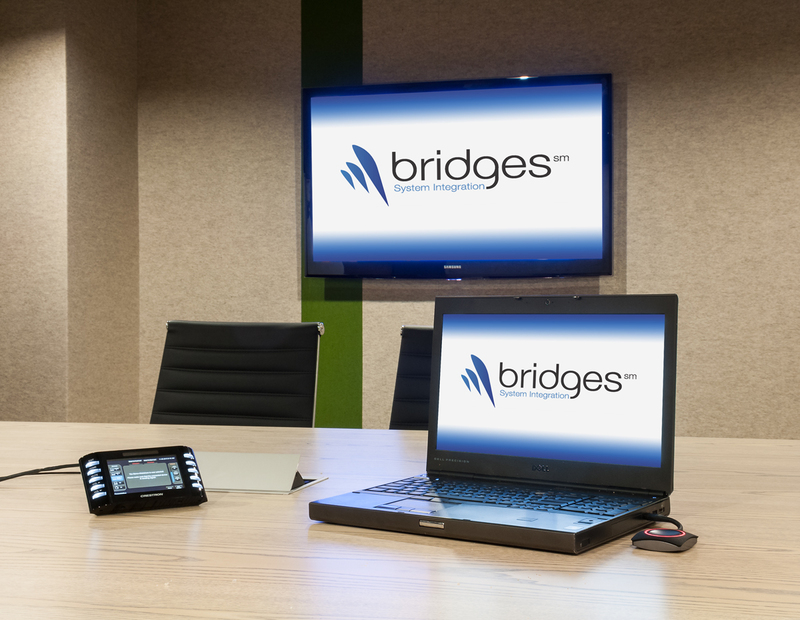 Bridges SI deployed an ease-of-connectivity Barco ClickShare wireless presentation device, which provides up to four participants with the ability to connect and display content simultaneously via USB.